Not a Singles Regretart. in Tennis Mag. 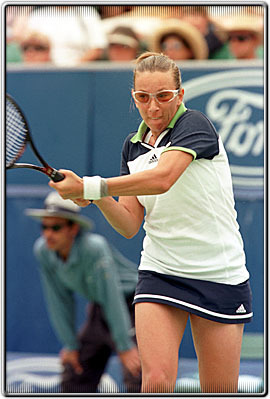 "First on the dance floor"
Mag�i ManiaA site about Magui Serna, the great Spanish tennis player. Tarabini TalesA site about Patricia Tarabini, the great Argentinian tennis player. ATTENTION: M.NAVRATILOVA N.ZVEREVA vs. WC M.MIDDLETON B.RIPPNER this ain't no senior tour......They are playing in Indian Wells http://www.pacificlifeopen.com this week (March 4-10, 2002) and perhaps the next tournament in Miami. Let's hope Natasha and Martina have the best of luck and hope they play more! 2001 The last time I heard of Natasha was in Australia with the Sydney Olympics. She made it to the Bronze medal round in doubles but lost. Wherever you are, Natasha, keep having fun! Overall, a good Frencho Open for Natasha. 1st: Glass/Wagner def. Kourni/Z., walkover? Jana announced that she will retire at the end of the year. YAH, yah, yah, Natasha is doing good! Geez Louise, it was 3 hours and 28 minutes, but she made it, isn't you blood pumping!? 5/27 1st round: Zvereva/Novotna(1) def. Halard-Decugis/Mauresmo, 5-4, ret. 6/2 Quarters: Davenport/Pierce(12) def. Zvereva/Novotna, 3-2, ret.